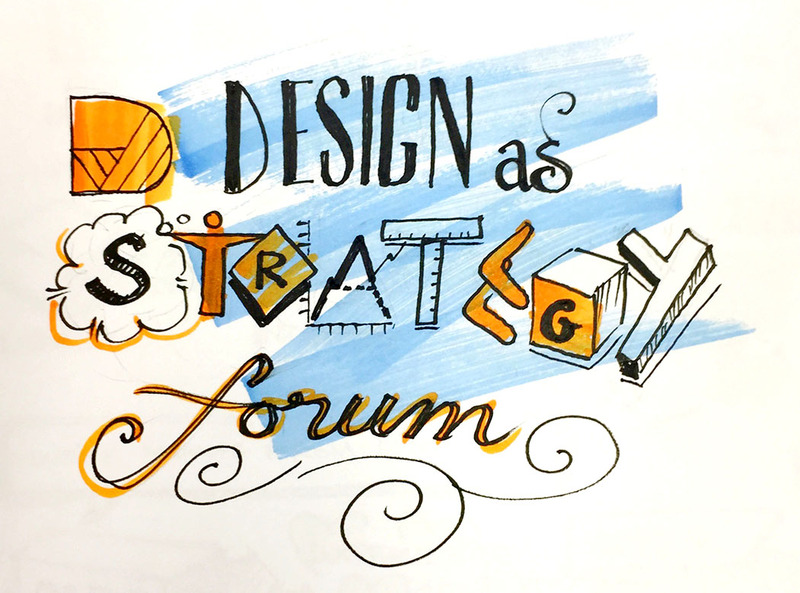 Yesterday I stepped out of the trenches to go to the Design as Strategy Forum, hosted by Good Design Australia. There was a broad spectrum of views, stories and wisdom coming from the front, all fuelled with plenty of great food and drink, and great Q&A. 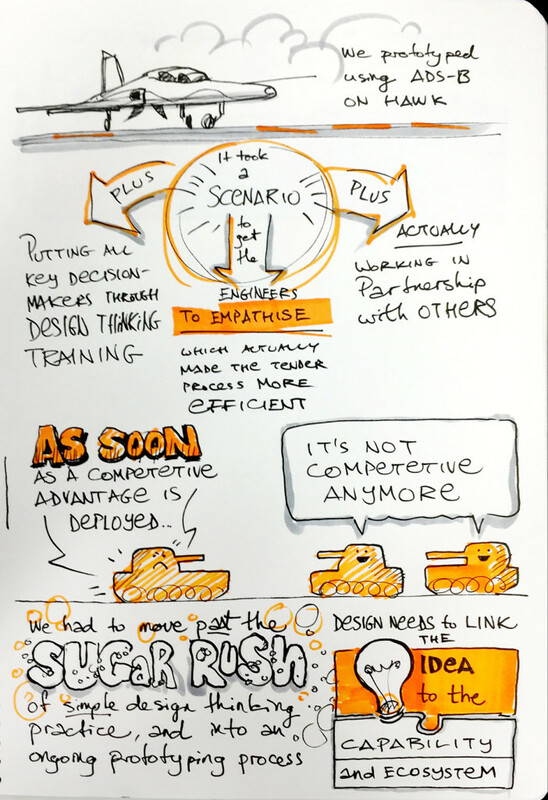 Many businesses have done the toe-in-the-water with design thinking, but struggle to roll it out across the organisation… which begs the question: is it actually OK for it not to be, yet it still be effective…? Professor Ian Harper spoke with much energy and melodrama about how designers and economists past buddy up to bring more innovation to the business sector, because productivity. 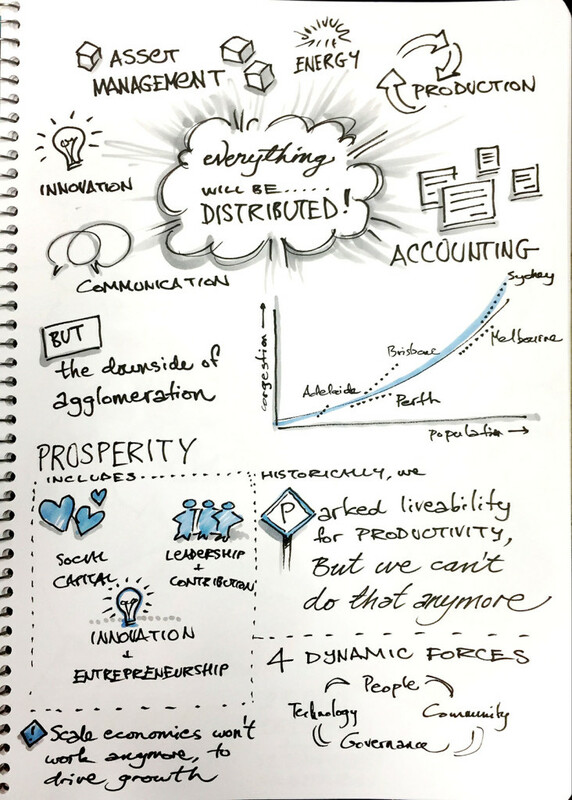 He seemed to put ‘creative people’ at the ‘design’ end of a scale, and economists at the ‘innovation’ end of the same scale… which didn’t make much sense to me… but his message about no longer chasing models of scale made a lot of sense. 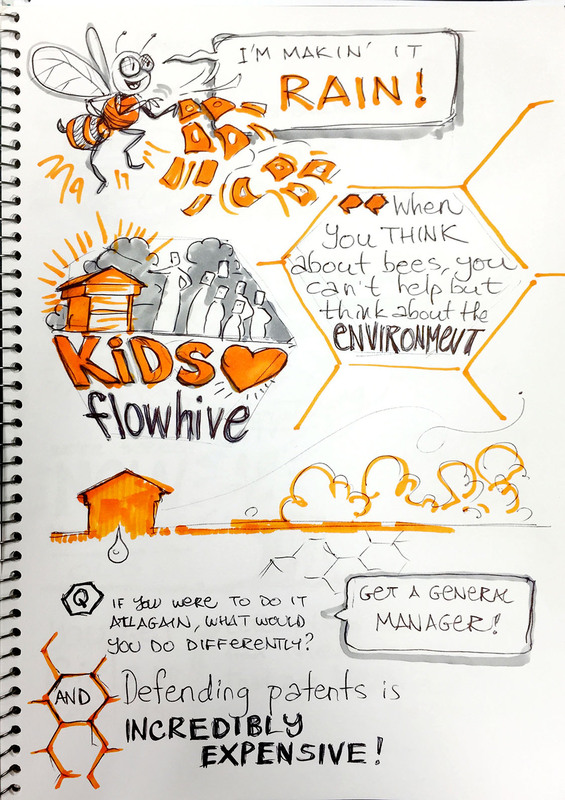 Stuart Anderson’s talk about his Flow Hive was great, as always. 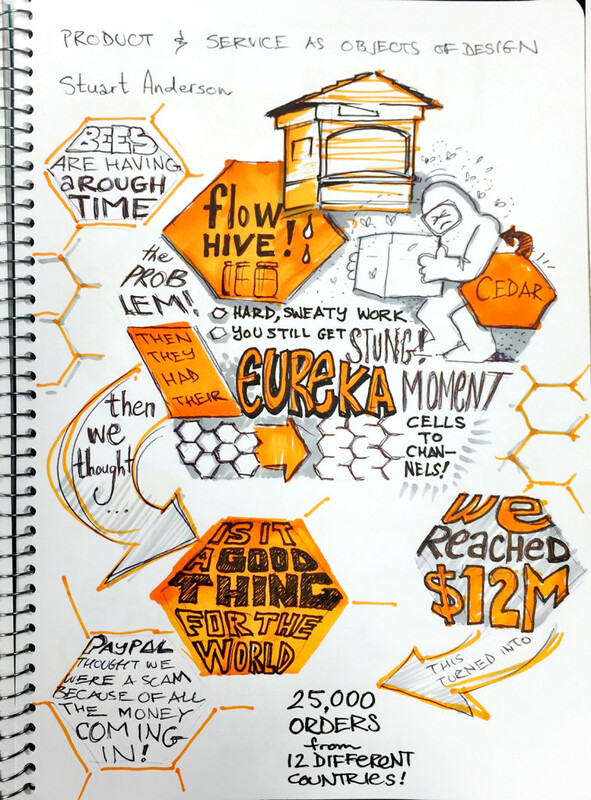 I thought I’d go with the hexagon as a layout motif throughout these sketchnotes… not sure if it worked that well! Dr. Jan Owens, CEO the Foundation for Young Australians, was brim-full of enthusiasm for the many many projects where young people have been involved. 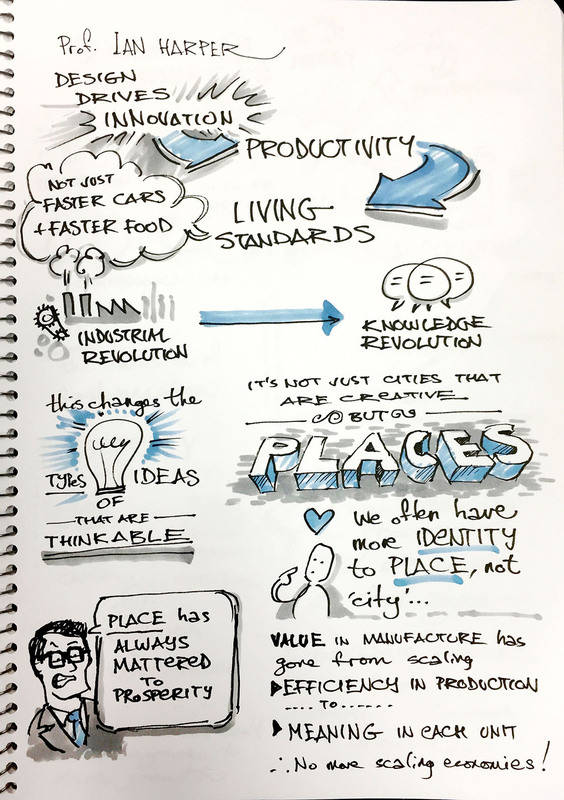 I was reminded of something that came out loud and clear for me from Link Festival 2016 conference: today, you don’t have to wait until you’re 18 to create your life-changing commercially amazing idea. 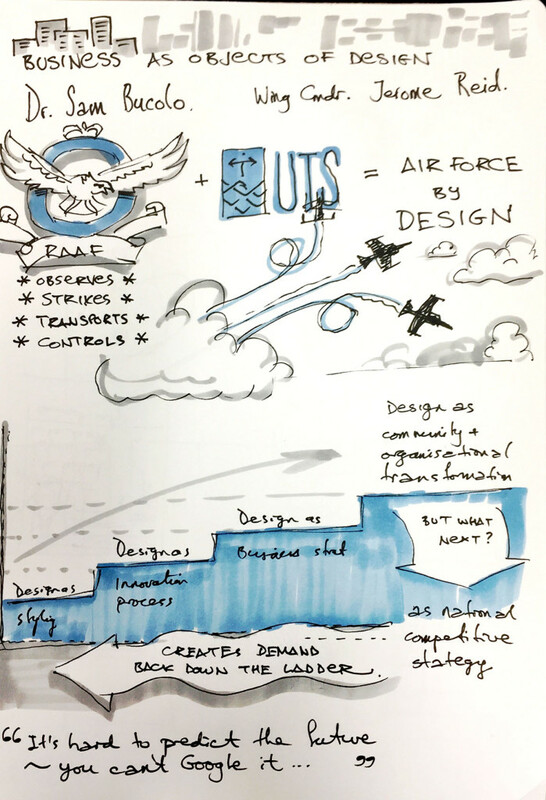 Dr Sam Bucolo and Wing Commander Jerome Reid got very real with showing how design thinking was applied to strategic transformation in the Air Force – this was definitely a highlight! 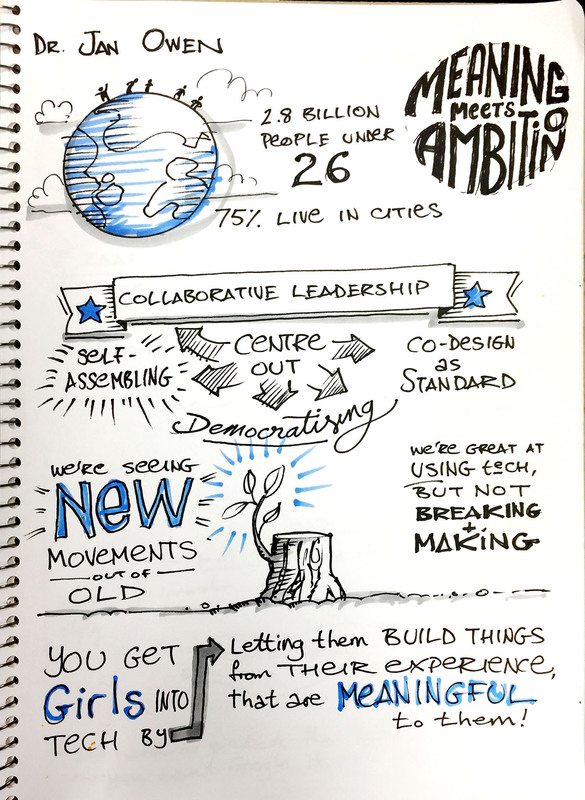 When not “doing bad things to bad people”, the Air Force has been busy devising and rolling out ways to iteratively prototype better ways of – well – doing bad things to bad people… but the key idea for me was that there is a space for design as community and organisational transformation, beyond business model design. And all of these orders create demand for the preceding orders. 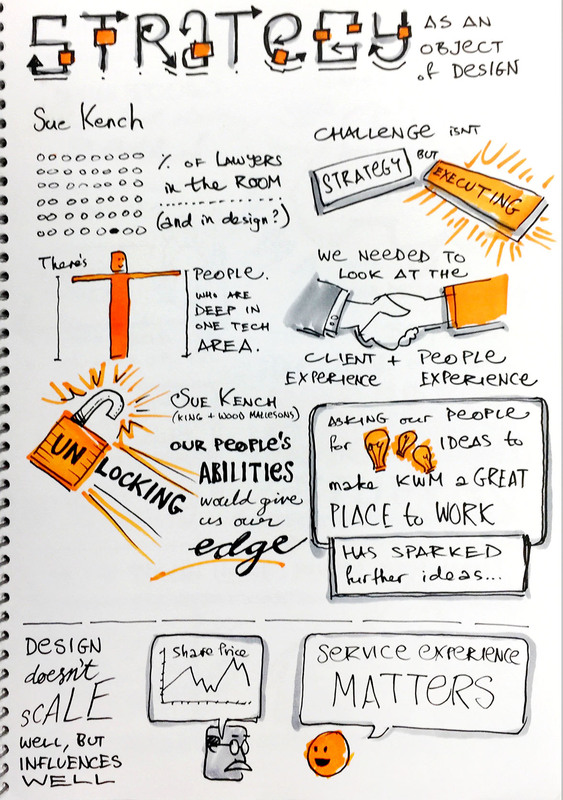 Sue Kench (Chief Executive Partner at King and Wood Mallesons), Jacqui Jordan (Strategic options lead at Suncorp) and others held a great conversation about strategy as an object of design. 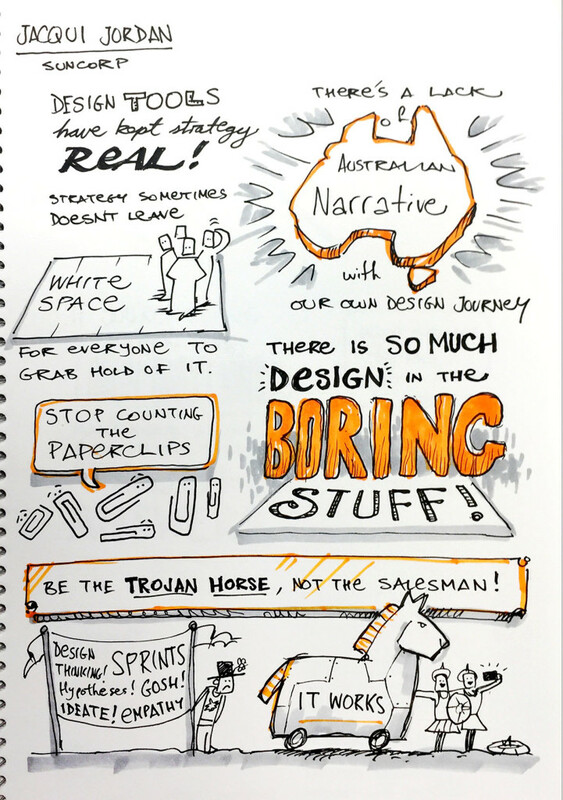 One of the big messages here was the need to demonstrate the mindset and process in action, rather than treating it as a sell-job. Everyone is over hearing all the regular statements, and are hungry for tangible realised benefit.